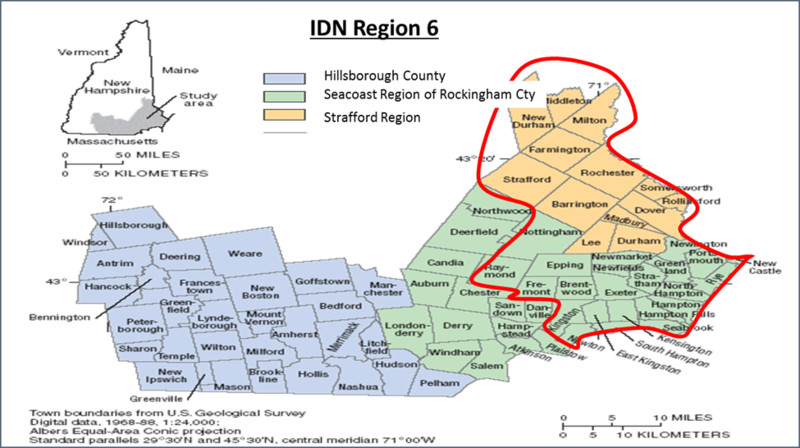 Home to 268,800 people, (21% of the entire State) the Region 6 IDN is a compact geographic area anchoring the state’s southeastern coastline that demonstrates a dual identity with respect to wellness. The northern tier of Region 6 includes the 3 towns and 10 cities of Strafford County, also the Strafford Public Health Region. In the southern tier, the Seacoast Public Health Region serves 1 city and 22 towns in eastern Rockingham County and is home to 50% of Rockingham County residents. Although the Seacoast Public Health region only represents about 50% of the Rockingham County population, the populations are very comparable so a vast majority of population health data for Rockingham County can serve as an accurate proxy for the Seacoast Public Health region, which has limited discrete population health data. Region 6 is bordered to the east by Maine and to the south by Massachusetts, as Figure 1 below illustrates. Although most of Region 6 is within a two-hour drive to the NH White Mountains, the central Lakes Region and Boston, Massachusetts, the condensed geography belies two very diverse subsections of the region. A recent report on regional health status found that Rockingham County ranked first among the 10 NH counties in health outcomes, or how long people live and how healthy people feel while alive, and in health factors, including health behaviors, clinical care, social and economic variables, and physical environment factors. Strafford County ranked 8th out of 10. (RWJF County Health Rankings 2016). Bordered by Maine and the Atlantic Ocean to the east and Massachusetts to the south, there are many challenges that both sub-regions share despite their many differences.